Babies are not capable of differentiating between things that are safe for them and those that are not. This is the reason why adults are charged with the responsibility of ensuring that they are safe at all times. Babies that can crawl or walk usually go to places or pick things that may be hazardous to their health. For this reason, when there is a baby in the house, parents take active steps to make sure that the house is childproofed for the baby’s safety. There are many things you can do to ensure that your home is safe for your little one and one of them is the installation of baby gates. These gates help to ensure that your baby stays where you want them to be i.e places that are safe for their health. Baby gates also known as child safety gates are installed in the home to create a barrier between babies and area that are not safe for them to access. These areas may include staircase, bathroom, kitchen, balcony and the likes. Also, the gate may be installed to prevent babies from going outside the home on their own. Baby gates, just like other gates installed around the home are usually made of different materials like plastic, metal, or wood. It is ideal for infants and toddlers that can move on their own. The gate is usually removed when babies become capable of climbing over or opening it. There are different types of child safety gates on the market. They are all designed to cater to the needs of different home designs, which invariably means the best one for you will be dependent on the design of your house. This section will provide you with details on the most popular types of baby gates on the market. All child safety gates on the market can be broadly categorized into permanent and removable gates. 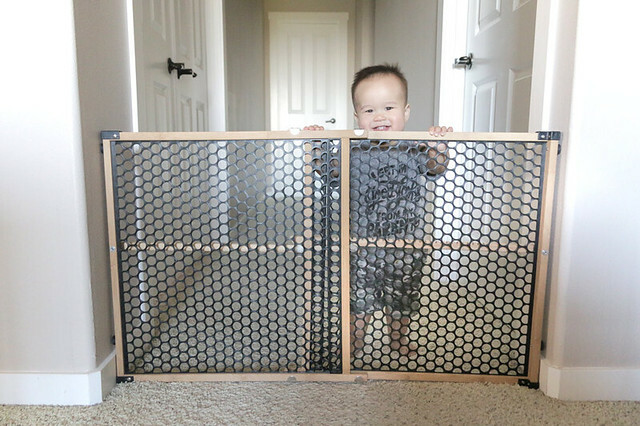 While the permanent gates are installed to enhance the safety of kids in the home with no known time of removal, removable baby gates are installed for a purpose. After the purpose ceases to exist, the gate is removed by homeowners. Removable baby gates are usually installed to restrain the movement of babies for their own safety. Permanent gates, on the other hand, are ideal if you are looking to contain the movement of pets in the home. 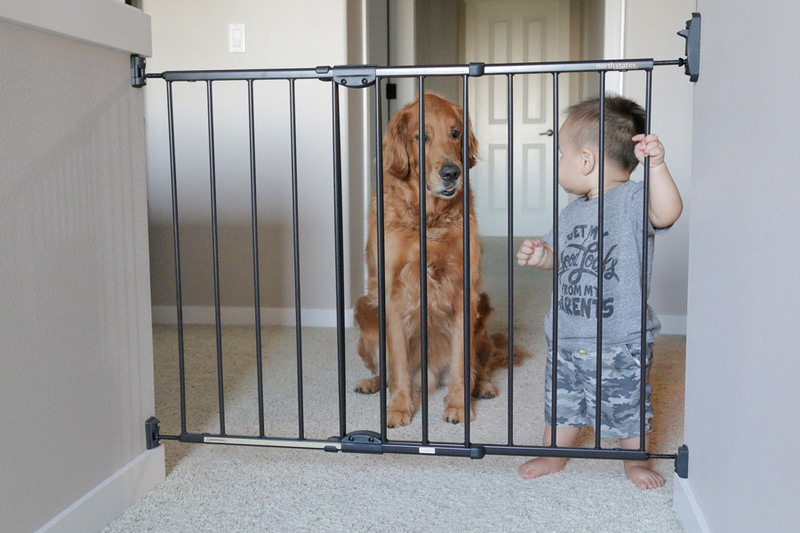 Pressure mounted baby gates are installed without the need for hardware. This type of gate is held in place by friction with walls on both side or wall on one side and the frame of your stairways on the other. They are usually mounted at the gate of rooms as well as the top and bottom of stairways. Pressure mounted child safety gates are preferred by many parents as it is easy to remove when the need for the gate seizes to exist. Also, they are reasonably priced and easy to install since there is no need for tools. Unlike pressure mounted gates, hardware mounted child safety gates require the use of hardware for proper installation. This type of gate is usually screwed into the frame of your stairways or walls thereby allowing it to swing open and close like a traditional gate or door. Hardware mounted gates can be installed in doorways, stairways, balcony, bathroom, and other places you will like to prevent your baby from accessing at will. Hardware mounted gates are somewhat hard to install and slightly more expensive compared to their pressure mounted counterparts. A baby play area, also known as play pen, or play yard is another way to restrict the movement of your baby thereby enhancing their safety in the home. When choosing the best baby gate, you will likely come across this type which can be hooked together to form a play or sleeping area. 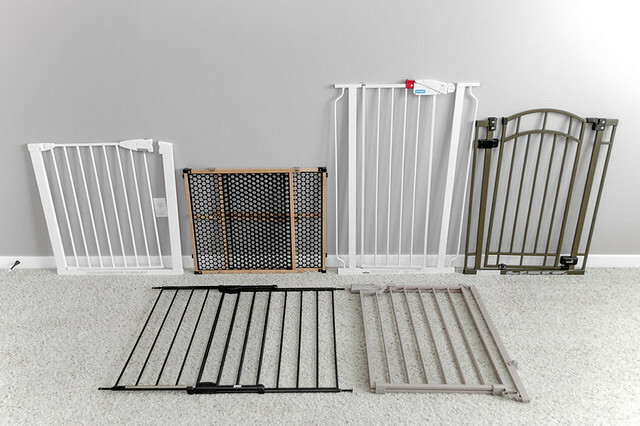 With this type of baby gates, you don’t need to mount it on a way or stairway as you can simply restrict your child movement by mounting the gate pieces together. The advantage of this type of gates is that they restrict the movement of your little one even within a room. Baby play area gates can be carried from place to place which allows you to restrict the movement of your little in places of your choice both indoors and outdoors. A rug, blanket, or toys can be placed into the play den to keep babies entertained. 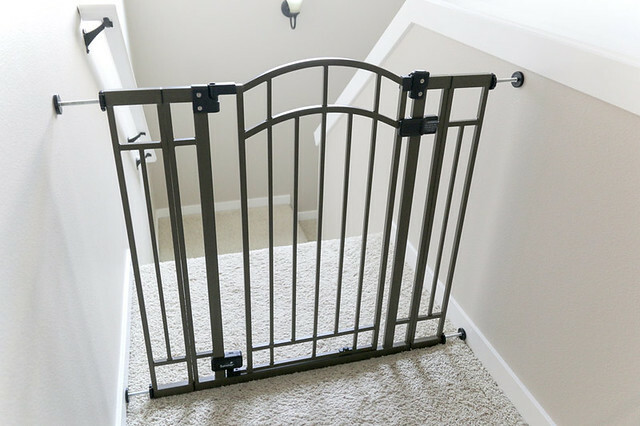 Furthermore, this type of baby gates is ideal for preventing pets from moving around. If you want to restrict the movement of pets or prevent their direct contact with kids in the home, then a play den will be a great choice. 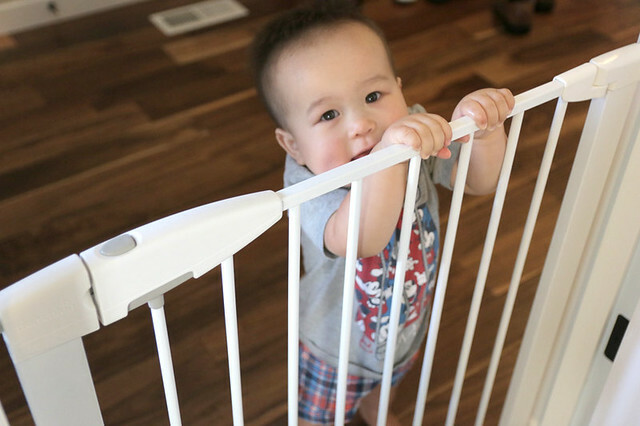 Child safety gates can be used to prevent babies from going up and down the stairs. If your little one is just learning to crawl or walk, they may be unaware of the fact that the staircase is dangerous for them but you can assure their safety with the installation of baby gates. Baby gates can also be installed on the doorway of your little one’s nursery to restrict their movement to the room. This is ideal after you have ensured that the nursery is childproofed and safe for your little one to move around. As already mentioned, a baby plays den can be installed to restrict your little one’s movement within a room. It can also be installed to prevent your baby from entering specific places that are not safe such as the bathroom, kitchen, basement, balcony or outside the house. It helps to enhance the safety of your baby in the home. Prevent infants and toddlers from accessing dangerous places in the home. Installing a child safety gate in the home will allow you to indulge in other activities in the home without worrying about your little one’s safety. It can be used to restrict the movement of pets in and around the home. Baby gates are offered at an affordable price. It is reusable and can be reinstalled for other kids as it has a long life span. Installing a child safety gate may restrict the free movement of other members of your household, which most individuals will find inconvenient. However, looking at the benefits it offers both for you and your baby, one may safely conclude that the inconvenience that accompanies the installation of a child safety gate is a small price to pay. Previous Previous post: Are There Male Ants?